It is hard to say that this has been "a great year" and not cringe a little bit. We have been able to help thousands of men and women. And to serve over 10,000 plates of food. And I know that is remarkable. And that we are blessed to have wonderful volunteers and a great donor base. But it is really cold outside. And this Monday there will be 150+ desperate men, women, and children in line looking for help. And it should never be lost on us, that even in a great year, the need swells. And there is no end to the need. We don't promise to end homelessness. We hope to create opportunities. And 2nd chances. And 3rd chances. And 4th and 5th if needed. Our hope is that men and women will get back on their feet. And that more opportunities will come. And that at the end of a season, more and more people will be able to smile and say that it was a great year in Philadelphia. Posted on December 10, 2016 by adam bruckner. The banner on the Philadelphia Free Library advertises "SACRED STORIES." It is not highlighting homeless individuals along the Parkway, but it could. We have hundreds of men, women, and children with unique stories. Sometimes common and other times, absolutely uncommon. A lot has changed in our 650+ Mondays (including our location recently due to construction and fences). And much has stayed the same during that time, especially the appreciation that every individual deserves respect. And dignity. And a good meal. Posted on October 12, 2015 by adam bruckner. This past week the Philly Restart team had fun celebrating Fila's 50th birthday at the meal. We had cupcakes and sang to Fila, and he even wore his birthday crown with pride. Happy 50th, Fila! Posted on November 20, 2014 by Lauren White. Old picture, same story. If you don't have ID, you can't do many things to move forward. 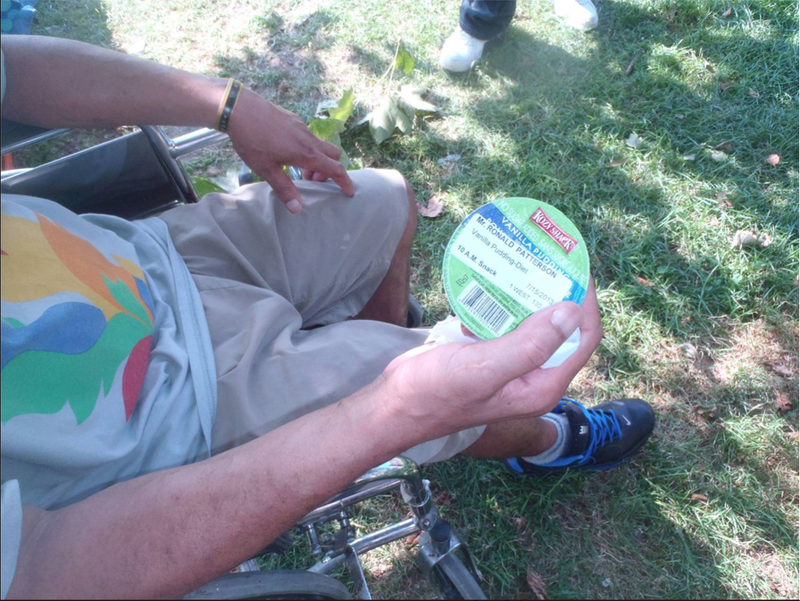 This man was in a wheelchair using the cereal he had from the hospital as his identification until he came to Philly Restart for help. At Philly Restart we help the homeless get back on their feet again by providing ID. For more information on this, visit our What We Do page. Posted on March 11, 2014 by Lauren White. People line up to receive food and identification assistance on a cold, Monday evening. For 11 years and over 550 Mondays, we have served a weekly meal on Vine Street in Philadelphia. Over the years we have seen the extremes of every season, and this has been highlighted recently with the freezer-burned January whip. It is on the coldest of these days that I am able to see the depth of the needs of the poor in Philly. You have to be really hungry to stand in an outdoor line for 30 minutes for a good, hot plate of food. You have to be really desperate to stand in an outdoor line for an hour to get help obtaining an ID card. There has been some tension over the years regarding whether or not we should be allowed to serve outdoor meals to the homeless. On these Mondays, when the wind seems to be carrying razors, it is clear that we do not create a problem, but we are there to meet a need. And it is not just food distribution and identification assistance, but we are a Monday family to many. For some, we are the most consistent things in their inconsistent lives. We meet the needs where we can, and we pray when we cannot. There was a moment a few weeks ago that was a glimpse into the heart of what we do. A homeless man came up in bitterly bad shape from the elements, and a volunteer offered him a pair of gloves. The man quickly accepted, but was unable to straighten his finger to get his hands in. I didn't know what was happening, but I looked over and saw a grown man rubbing another man's hands to share the warmth that was required to meet the need. Posted on February 4, 2014 by Lauren White. In early 2002, I spent a great deal of time on the streets of Philadelphia talking with homeless. Fila was one of the first men that I met, and I was struck by his humor and ability. I was surprised that a capable 40-year-old man was sleeping on the sidewalk in front of the youth study center on 18th and Vine. Our program assisted and challenged Fila, and he has been living indoors for 8 years now. He is a member of a local church, he rents an efficiency apartment, and is a weekly volunteer with Restart. There is still some work to do; Fila was holding the camera backwards and accidentally took a “selfie” while trying to snap a group photo. Fila's accidental "selfie:" taken while attempting to take a group photo. Posted on December 8, 2013 by Lauren White.